In mid-September, while filling an old diesel truck at a gas station in Houston, Minnesota, I overheard a man of about eighty tell a friend, "They're opening the Catacombs." I had come to this remote part of southeastern Minnesota a month earlier to put together the "The Catacombs of Yucatan Sound and Video Installation" and now wondered how the man knew about it. Having spent considerable time tracking down and interviewing on video nine people who had worked at the Catacombs 60 years earlier, I reasoned that the word was getting out. After all, this was a culture where people still used their living rooms for "visiting." The "Catacombs of Yucatan" is a name for a limestone cave and dance hall which had been commercialized in 1934 in the hills separating Houston and Spring Grove; a venture which succumbed to hard times after several intense years. By the time I arrived in mid-August 1995, local memories had become vague, along with the access road which had once passed within 50 feet of the cave. I had spent many summers in the area since childhood (1950s) and knew a little about Catacombs lore. Now, with a McKnight Visiting Artist grant from the Minnesota Composers Forum, I was returning to dispersed memories, cave bats, cow manure, and an electricity-free cavern located a half-mile from the nearest gravel road. The cave installation fell perfectly in line with the sort of event I have focused on over the last three years: two inner-city installations and a neighborhood concert series. These were premised on a belief that "high-risk art," if presented respectfully and with care for detail, will be accepted by even the most conservative as natural and necessary and, in turn, will have a significant impact on social consciousness. And the formula has been the same: to present mature risk-takers (Paul Panhuysen, Phill Niblock, Warren Burt, etc.) within unlikely contexts which have a unique place within the memory of local society. There is much more to it than this, but, I must emphasize, for such events to have the most social and political impact, they must be stridently apolitical. They must not be about Bosnia, AIDS, the environment, nakedness, or some smiley-face issue which is equally political. They must be concerned with exploring new systems and materials precisely as a means of ensuring meaningfulness, accessibility, and, therefore, their non-elitist essence. The Catacombs of Yucatan is a small cave about 100 yards deep, located on a bluff overlooking the intersection of three valleys of incredible beauty. The first half of the cave descends 50 yards into the hillside to an intersection where two narrow rooms veer to the left and right. From here, a second and wider pathway descends sharply off to the right for another 50 yards, leading through two large chambers. The front half is characterized by a narrow path, high pointed ceilings and sound-absorbent surfaces. The second half features a wider path leading through the larger rooms with reverberant surfaces. These features dictated the structure of the installation, in which discrete, sight-oriented materials with a sound component were located in the first half, and heterogeneous, sound-oriented materials with a sight component were placed in the second half. The midpoint served as a transition between halves. Likewise, floor-positioned lights were used in the front half to push light upward toward video monitors placed on shelves, and gallery-like spots were placed in high positions to illuminate the sculptural instruments in the second half. The front portion contained five monochrome monitors with materials gathered from the video interviews. At the intersection, a cluster of "percussive videos" (color and monochrome monitors stacked and turned on axis while playing the same source material) was located, along with the first of six automatically-playing sculptural instruments spaced throughout the second half. The installation concluded with a dispersed cluster of color and monochrome monitors playing a minimalist video, which contrasted with the flashing "percussive" videos at the midpoint. As the patrons crossed the fields to the cave site (either by foot, tractor or horse-drawn wagon) they were first led by docents to the site of the old dance-hall foundations. Here a video tape was playing music performed 60 years ago which I had documented at the Highlandville schoolhouse in Iowa (a special dance was arranged for this!). The patrons were then guided along a path to the cave entrance, which had been reframed as a means of keeping bats and cattle out. 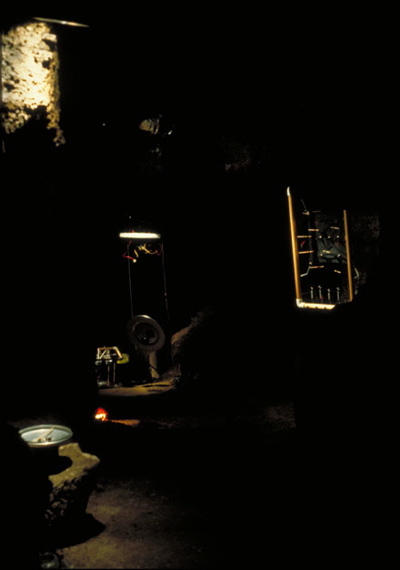 As visitors entered the cave, they encountered monochrome video monitors featuring former cave and dance-hall workers telling stories of their work experiences. These faded to white and silence between anecdotal episodes, creating a conversational counterpoint between monitor positions. As visitors approached the midpoint, the spoken sounds became mixed with the phasing and pitched staccato sounds of my Pendulyre as it accompanied a nearby cluster of flashing videos. From here they came upon sounds from two rattling Pushups (small metal plates which continuously toss geometric objects), and then the continuous beating of my Winged Pendulyre (similar to the Pendulyre). Next came the contrasting sound of my Bass Shmoos, a droning instrument and the only one played live during the exhibit. After this the installation was capped with the clangorous and roto-tom sounds of my Penduling (another pendulum-based instrument) as it accompanied three nearby video monitors showing a continuous video of a seven-day-old child falling asleep. With over 1200 local farmers and small-town people attending the two-day event, and considering the staggering amount of hard labor needed to prepare the cave, volunteer support was indispensable. Leading up to the event, I was supplied with power and hand tools, and with labor in the form of scheduling interviews and organizing the volunteer force, along with tasks such as fence-mending. I was provided with a 4-wheel-drive truck and a place to stay, and one farmer participated by leveling the dirt road I had created by driving the same route to the cave daily. On the day of the opening, unscheduled volunteers showed up, asking to help out. And at no time did anyone ask whether it was art or music or even ridiculous. It was interesting and necessary.